The Northern Corridor is a Key transport route in East and Central Africa. The main Northern Corridor artery is served by a combination of transport modes and infrastructure facilities that include: the Maritime Port of Mombasa; road network; rail network; inland water routes; inland container depots; and, an oil pipeline. All these form part of the Northern Corridor infrastructure used in facilitating the flow of goods across Member States. 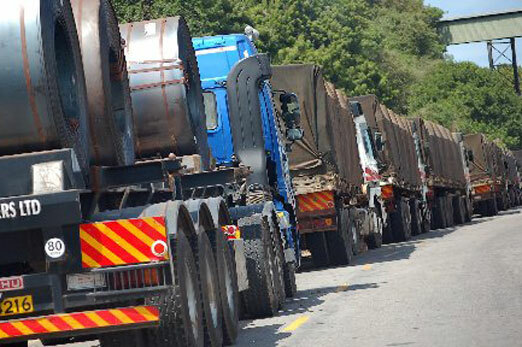 It is estimated that of 96% of goods from the Port of Mombasa are transported by road leaving the remaining percentage to be through the railway mode, inland waterways and pipelines. An alternative transport network serving the landlocked Great lakes region is through Tanzania, in the Central Corridor. The 1,400 km-long corridor uses lake transport on the Lake Tanganyika to Kigoma in Tanzania, and then road or rail to Dar-Es-Salaam. Another option is the Deep South route, through Zambia, Zimbabwe and South Africa. This corridor uses lake transport on the Lake Tanganyika to Mpulungu in Zambia, and then road transport, or a mix of rail and road transport, to Durban in South Africa. This option is too far from the Great Lakes countries.